Welcome to the 2018 BCCM conference and I’m delighted to see many familiar faces- thank you for taking the time to attend this significant event. We are getting close to the end of a year and it is an excellent time to pause and reflect upon all that has occurred in the preceding twelve months – “our stories, our strengths” and yes, our weaknesses too since we last met as a group last year in Brisbane. For my industry, the financial sector, it has been interesting to say the least, at times, extremely disappointing to observe the Banking Royal Commission and the uncovering of so many unacceptable practices and processes. I am sure that the industries you represent, while perhaps not undergoing the scrutiny of a Royal Commission, have endured their own challenges, obstacles and opportunities too. Looking back on the ups and downs, the predictable and the unexpected, has helped shape and more recently sharpen my thinking that there has never been a better time to be a mutual organisation in Australia. Mutual organisations, it is fair to say, don’t have a headline-grabbing name, a catchy jingle or celebrity endorsement but we do have something that consumers want more than ever before and that is trust. All of us here have a trusted brand – it is our biggest asset built off close relationships with our owners. Society is screaming out for trust, especially at this juncture in Australia’s economic and political history. Trust that we will do the right thing. Trust that we will deliver on what we promise. Trust that we go about business in a way that stands up to the most rigorous of standards. I like to think about trust in the context of a house. Trust is the foundation of the house that mutual organisations have built in Australia, a house built by stakeholders, not just shareholders – customers, staff and local communities. These stakeholders are profoundly invested and connected with the mutual idea and all that it has to offer as a central point of a community that cares. In the financial services space we are seeing more, people being attracted and knocking on the door of this “mutual” house – keen to see what it is like inside a customer-owned organisation where you are part of a community that is alive and thriving. The challenge for us as leaders is to make sure that when we receive that knock, we are ready at every level to add value. We need to talk to them not at them. This is where the relationships begin and trust is built. This is what mutuals are great at- being in the community – it’s what customers want and it’s why there has never been a better time to bring about a better future. 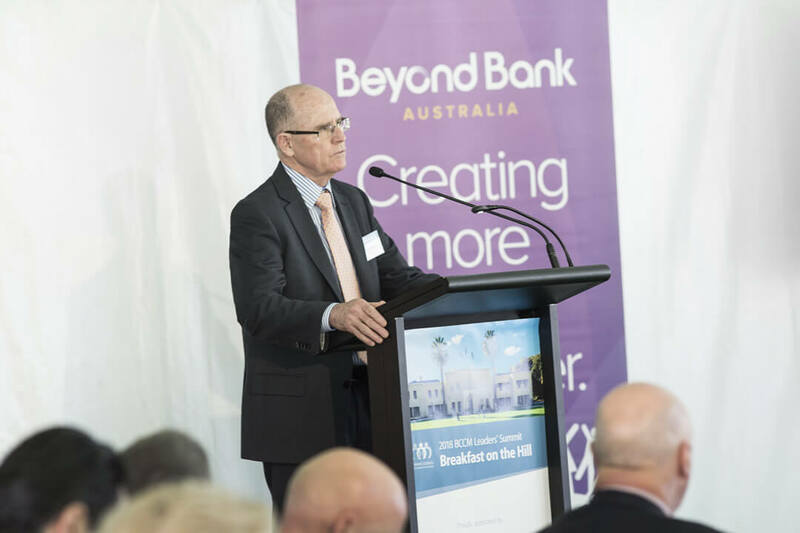 At Beyond Bank, sometime ago we were starting to hear that our customers, our local communities wanted something more from this mutual house they had built. Let’s call it an extension, a home improvement. They wanted to see a better way for business. A business about stakeholders not just shareholders, about being the best FOR the community not being the best in it. They wanted to see the efforts of owners past and present extended to another level. They wanted to see cooperation and working together in a way that created a more sustainable business. Not new ideas to any of you here today, I’m sure. In response to this we chose the B Corp pathway. B Corp, as you may know, is a global certification awarded after participating in several rigorous rounds of testing to prove that your company is committed to sustainability in all its myriad forms. It is not just about being “green” it is about being a sustainable business working to create a better society for all. And that’s what we are focusing on – “a better way for business” living what it means to be a B Corp – from the nuts and bolts of making our business sustainable to supporting causes that fit into community sustainability – for us this has meant forging connections with some 4000 community organisations across the country including those working in affordable housing, assisting services for the disabled and aged support. This is real sustainability for us – it’s a tangible and meaningful commitment and so far, it’s been a terrific experience and added significant value to our business. It takes collective endeavour to another level where the concept of shared value where the organisation, its owners and broader stakeholders all partake in the value created. I encourage all of you to consider, if you haven’t already, the opportunity to become a global B Corp member. With customers turning to mutuals, trusting mutuals and importantly, respecting mutuals – it is our time to show that working together, collaborating, and sharing our values can make a real difference for our members and our communities- make them better, stronger, more resilient –it’s a powerful way to do business.